Ok, so we're just wrapping up our project to paint the kid's rooms* when my wife says, "Oh, just one more thing. Now that the trim is white in all the rooms, can you please swap out the cream-colored outlets and light switches? I think they'll look better in white too." Uh huh. You know how Spiderman gets that tingly feeling because his "spidersense" is telling him that something dangerous is about to happen? I was tingling. 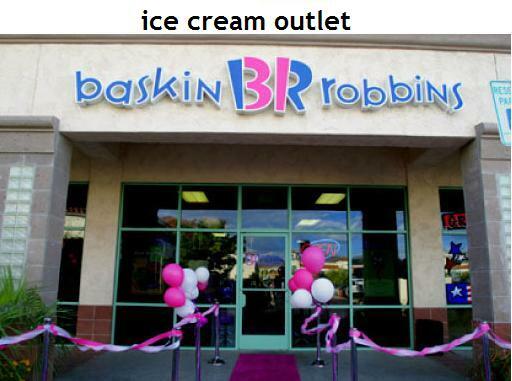 My first thought was sarcastic (imagine that) - God forbid - CREAM OUTLETS AND LIGHT SWITCHES! Something must be done. Surely we didn't want our guests vomiting upon entry into these rooms. But then I remembered my own sage advice* and simply replied, "Perhaps you're right dear." And so it began, the innocent task of replacing the fixtures. Easy enough, I reasoned. Turn off the breaker, unscrew a few wires, screw a few wires back in, turn the breaker back on and wha-laa, replacement complete! I'd be enjoying the rest of my Sunday afternoon in no time. Ha! - Let's check the clock on this one. Start time: 1:00 p.m. The project started out fair enough. I easily swapped out the 3 outlets in bedroom #1, but not before I "crimped" the fleshy part of my thumb in the handle of the wire stripper/crimper tool (note: this hurts like hell). But then I moved into bedroom #2. Uh-oh. What's with all these wires in this box? My god, how did they ever cram four different sets of wire into such a small space? And what's this - did they really wrap two wires around the hot terminal instead of using a pig-tail? Yikes! But no need to fret, I've done this before. I'll just have to undo all the wires and do it right. BTW, at this point I'm thankful these are 2-prong outlets that should be replaced anyhow because doing all this just to replace the "cream" color was quickly losing its justification. Nonetheless, I eventually finished replacing all the fixtures in the bedrooms and bathroom and quickly ran downstairs to flip the power back on. But instead of the breaker staying on, I get "buzz-click" instead. What the f*@%! How could there possibly be a short in my work? It wasn't that complicated. Well... apparently, when I shoved the wiring back into the box, the fabric on the ancient cloth-covered wiring was so old and brittle that it crumbled like dust, thus exposing the deadly wires inside to the metal gang-box and causing a short. So now I'm thinking, what the hell - cloth-covered wiring??? I mean come on, what were they thinking when they came up with this? Genius 1: "I know, lets put cloth over these wires. It may not be an excellent insulator but it will be cheap and sure to last for months to come." Genius 2: "Why - didn't our experiment to coat them with cornbread work out?" Bottom line - I eventually got the job done but not until 9:00 p.m. Of course there is soooo much more to this story, but I've spent enough time on this project as it is and it doesn't deserve more of my time writing about it as well. 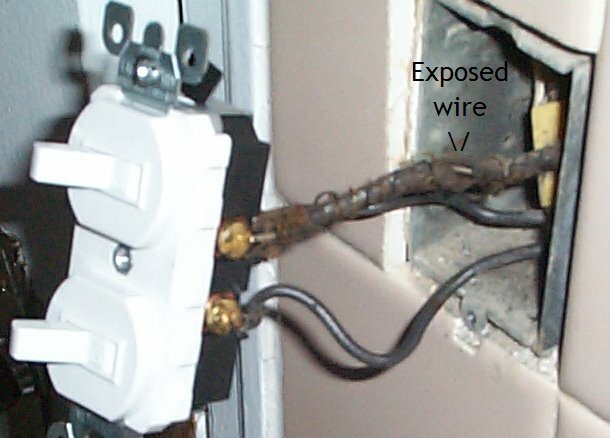 ALWAYS ALWAYS ALWAYS test your wires with a meter even though you're sure you have the breaker off for the room. 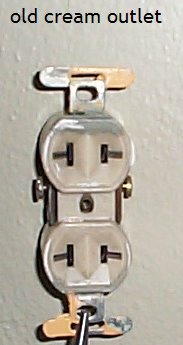 The 4th outlet in bedroom #2 just happened to be on a separate circuit, but because I'm smart enough to meter each one before I touch them, I was able to avert death. A nice side benefit. If you're going to replace 9 different fixtures, always test each one immediately after you finish it rather than doing them all and testing them when you're done. This way you'll know exactly which fixture is causing the short and you won't have to go back and undo them all and start over - after you've already spent 4 hours on the project (uh, this is what I've heard). And finally, if your wife asks you to replace all the outlets in the upstairs because the shade of white is off, don't listen to me. Tell her how you really feel! Oh boy, don't get me started! Don't forget I left out about 7 hours worth of story in this post. Let's just say I wasn't doing this wiring project alone. My best friend Mr. Murphy was right there alongside me.